"It is indeed a pleasure for me, as a representative of the people who once inhabited this very spot, to come before you, our White Brothers, who are now sitting about our Council Fire. The Council Fire of the Red Man is never lighted unless there is an important function to perform. The reason we have gathered here tonight is to welcome you to the 1947 camp season. It is the wish of our camp officials that I bring you words of wisdom from the lips of my people, for the Red Man is known for his courage, his loyalty, his skill in campcraft and woodcraft, and his reverance for the great out-of-doors. To assist me in bringing you this message I will call on some of my Braves to enlighten you as to your duties here at Camp Oyo. Hearken to their words!" And so began the twenty-first annual Boy Scout summer camp in "Ohio's Little Smokies." Native American culture, particularly popular notions of Shawnee and Cherokee culture, have long been central motifs at Camp Oyo, which is named for what many believe to be the original Indian word for the Ohio River. In 1930, for example, Scout Executive and longtime Camp Director, Harry Wagner, promised campers "the romance of a full blooded Indian," a fine young college man" recruited from the Haskell Indian Nations University in Lawrence, Kansas. This unnamed young man was to be given the title of "Camp Fire Director," charged with the responsibilities of "Indian dancing, archery, costume making, and camp fire ceremonies." Camp Oyo has also long been recognized for its beautiful location in Shawnee State Forest. "Everybody who gets down to Camp Oyo long enough to really look around," explained a promotional flyer from 1930, "falls in love with the camp and site. 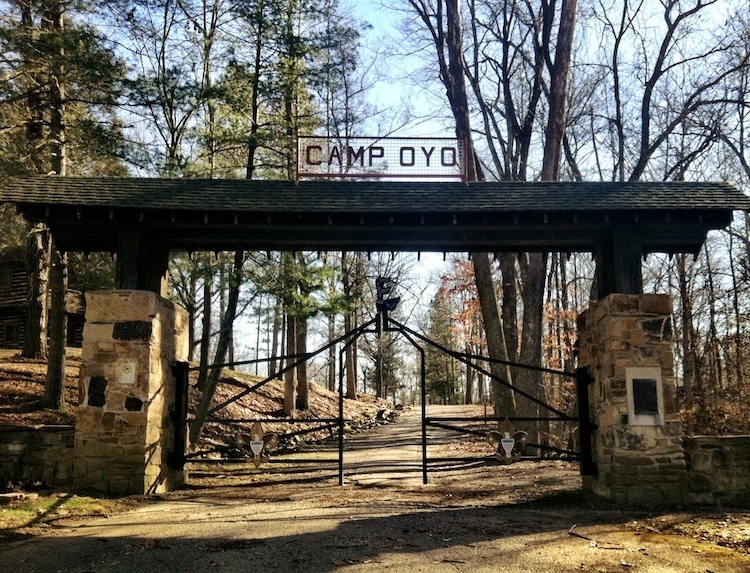 Situated on ... the banks of Turkey Creek in a small cove in the highest hill country in the state of Ohio and surrounded by forests and some of the wildest land in the state, Camp Oyo is ideally located. "The beauty and peace of the hill country and forests is indeed catching and many a parent visitor or business man remarks: 'I don't think this is fair! I've just been here long enough to appreciate the place and want to stay a week and just can't.' Camp Oyo is located in the very heart of that 'Back to Nature Country.' Forests, birds, wild animals; good water and fresh flowers, gurgling brooks, hills, cool air and cold nights, all combine with an abundance of health-giving sunshine to make Camp Oyo the ideal camp." Camp Oyo has its origins in 1926 when local businessmen, led by Harry Wagner, "secured the permission of the Governor of Ohio to make use of a tract of waste land in one corner of the 30,000 acres that comprise Roosevelt Game Refuge." As told in a 1930 promotional flyer, "a fine play field was laid out, clear, pure water secured by a deep well, a large mess hall, 30 by 60 feet was erected, which accommodates 100 comfortably for meals and rainy day programs. The campus cleared on the edge of the forests is large and here amid hills, forests, streams, with ample sunshine and fresh air, in a marvelous setting large heavy army tents are erected for sleeping quarters." 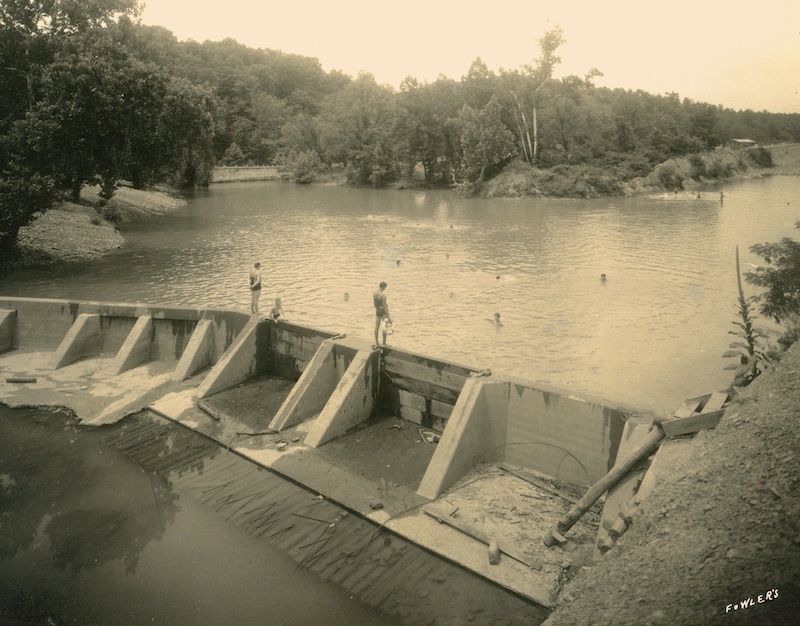 By 1930 a dam had been built across Turkey Creek, "with dates to allow for regulation of the waters and to make perfect a fine swimming hole." Then, in the fall of 1934, major improvements were made to the camp thanks to a Depression Era relief program of President Franklin D. Roosevelt's New Deal. 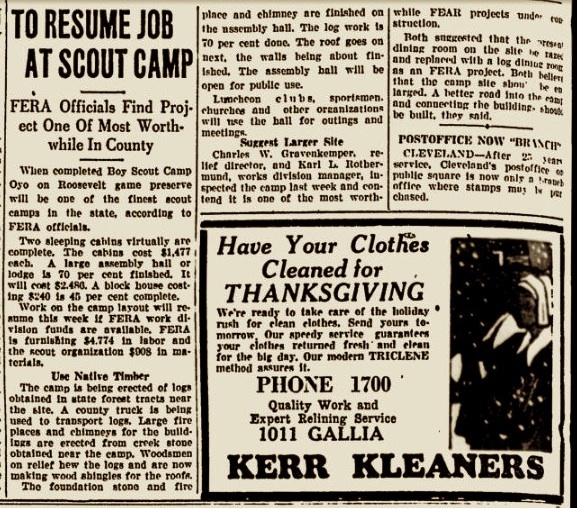 FERA, the Federal Emergency Relief Administration, the precursor of the Works Progress Administration (WPA), joined with the Boy Scouts to fund the project. FERA furnished $4,774 in labor costs and local Scouts, via donations, provided $908 in materials. As reported by the Portsmouth Times in November 1934, "the camp is being erected of logs obtained in state forest tracts near the site. A county truck is being used to transport logs. Large fire places and chimneys for the buildings are erected from creek stone obtained near the camp. Woodsmen on relief hew the logs and are now making wood shingles for the roofs." Those "woodsmen on relief" were members of the Civilian Conservation Corps who were stationed at nearby Camp Roosevelt. Company 1545, an all-black, World War I veterans unit, can be credited with the construction work. The swimming pool was added in 1938 and the present entrance gate, recognizable to thousands of boys and their parents who have walked through it, was built in 1955 with funds donated by the Portsmouth Elks Club. The camp has long been open for use by other organizations. 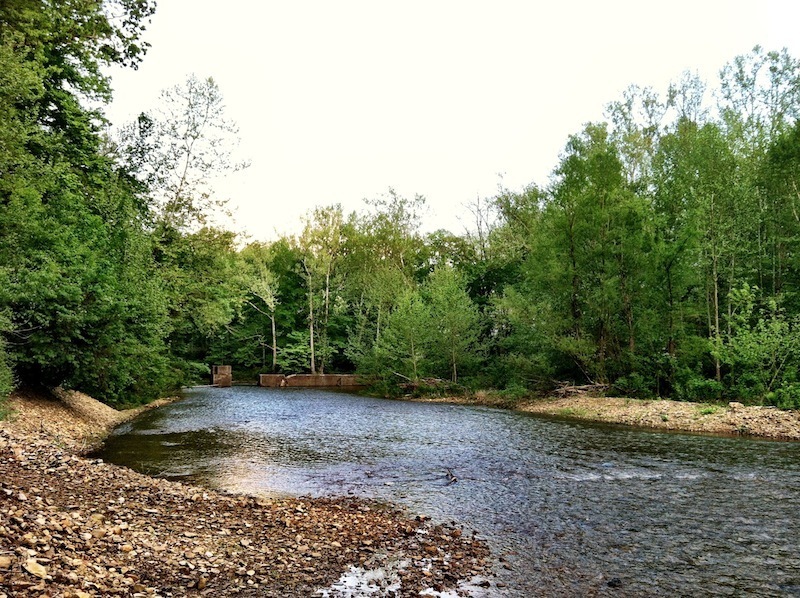 In its early days, 4-H groups frequently used the facilities of Camp Oyo and enjoyed the waters of what the scouts call "Murkey-Turkey Creek." Today Camp Oyo is within the bounds of the Tecumseh District and is administered by the Simon Kenton Council of the Boy Scouts of America. 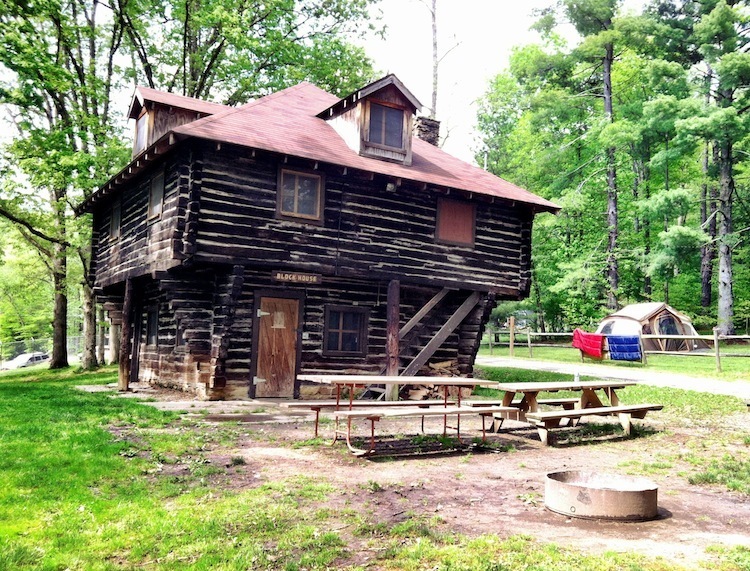 The names of Tecumseh and Kenton speak to the region's frontier past and Camp Oyo, with its CCC-built cabins, constructed from the Forest's blighted American Chestnuts, is a reminder of the role played by the state and federal governments in the development of recreational facilities in today's Shawnee State Forest. Greetings to Camp Oyo Campers, typescript, 1947, Papers of the Camp Oyo Alumni Association, Scioto Historical Collection, Digital History Lab, Clark Memorial Library, Shawnee State University, Portsmouth, Ohio. "Game Refuge Is an Ideal Location for Scout Camp," Camp Oyo Boy Scout News, Portsmouth, Scioto Area Council, 1930, Papers of the Camp Oyo Alumni Association, Scioto Historical Collection, Digital History Lab, Clark Memorial Library, Shawnee State University, Portsmouth, Ohio. "Splendid Leaders are Tom Make Up Camp Oyo Staff," Camp Oyo Boy Scout News, Portsmouth, Scioto Area Council, 1930, Papers of the Camp Oyo Alumni Association, Scioto Historical Collection, Digital History Lab, Clark Memorial Library, Shawnee State University, Portsmouth, Ohio. "Story of Camp Oyo," Camp Oyo Boy Scout News, Portsmouth, Scioto Area Council, 1930, Papers of the Camp Oyo Alumni Association, Scioto Historical Collection, Digital History Lab, Clark Memorial Library, Shawnee State University, Portsmouth, Ohio. "To Resume Job at Scout Camp," Portsmouth Times (25 November 1934), Scioto Historical Collection, Digital History Lab, Clark Memorial Library, Shawnee State University, Portsmouth, Ohio. Entrance to Boy Scout Camp Oyo, Scioto County, Ohio (13 December 2012). : Photo Credit: Andrew Lee Feight, Ph.D., from the Scioto Historical Series, private collection, Friendship, Ohio. 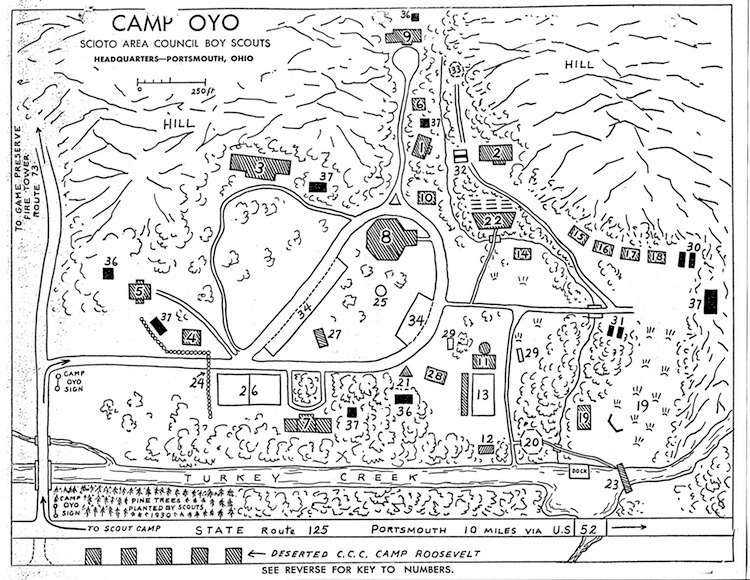 Camp Oyo Map, c. 1937: Image courtesy the Camp Oyo Alumni Association. 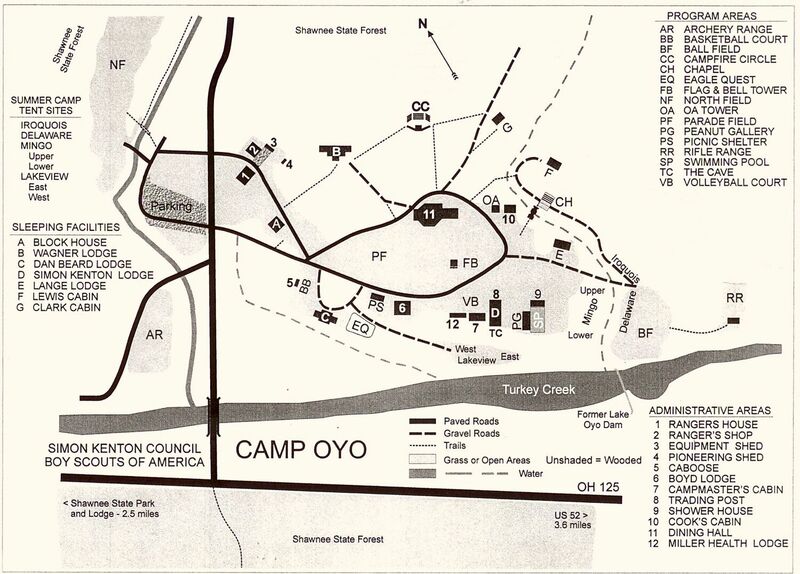 Boy Scout Camp Oyo Map, c. 2004: Image Credit: Scioto Historical Collection, Digital History Lab, Clark Memorial Library, Shawnee State University, Portsmouth, Ohio. Blockhouse Cabin, built with federal funds and locally donated materials in 1934, Camp Oyo, Scioto County, Ohio (3 May 2012). : Photo Credit: Andrew Lee Feight, Ph.D., from the Scioto Historical Series, private collection, Friendship, Ohio. Portsmouth Times reports on new construction at Camp Oyo (25 November 1934). : Image Credit: "To Resume Job at Scout Camp," Portsmouth Times (25 November 1934), Scioto Historical Collection, Digital History Lab, Clark Memorial Library, Shawnee State University, Portsmouth, Ohio. Old Turkey Creek Dam, Camp Oyo, Scioto County, Ohio (c. 1930). : Image courtesy the Camp Oyo Alumni Association. Ruins of the old Turkey Creek Dam, Camp Oyo, Scioto County, Ohio (3 May 2012). : Image Credit: Andrew Lee Feight, Ph.D., from the Scioto Historical Series, private collection, Friendship, Ohio. 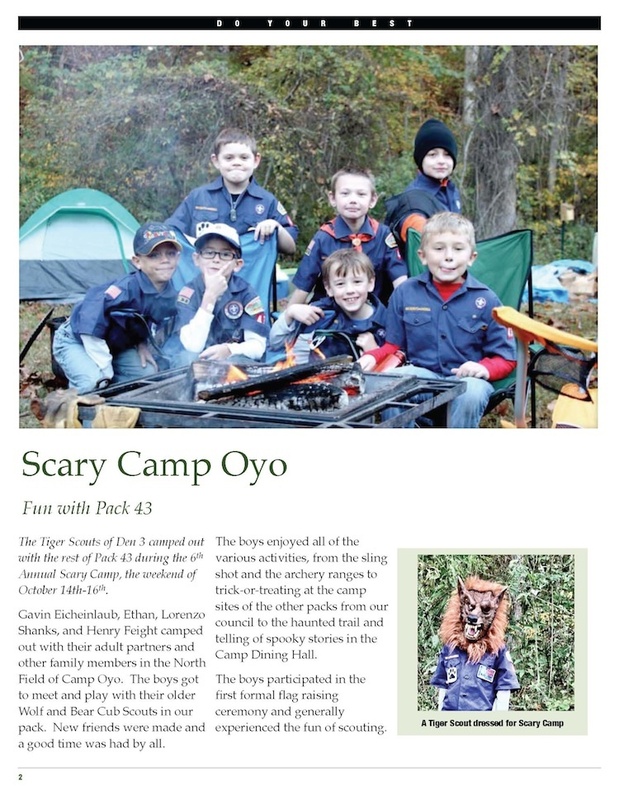 Tiger Cub Scouts at Scary Camp Oyo (October 2011). : Image Credit: Andrew Lee Feight, "West Tiger Cub Scouts Newsletter, November 2011," Scioto Historical Collection, Digital History Lab, Clark Memorial Library, Shawnee State University, Portsmouth, Ohio. 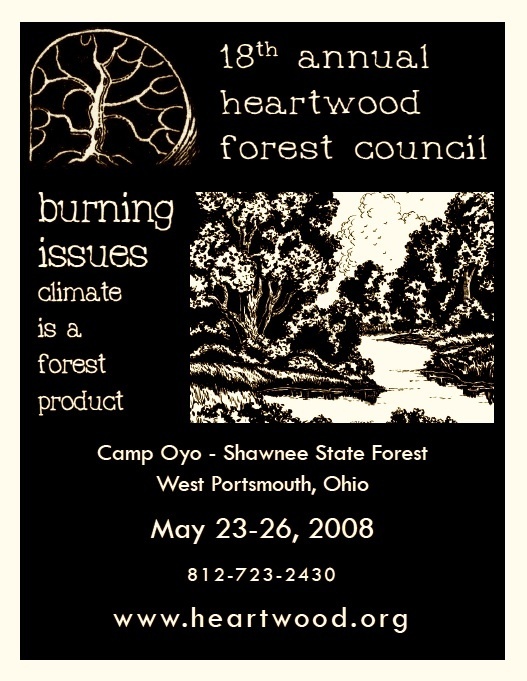 Burning Issues, flyer for the 18th Annual Heartwood Forest Council, Camp Oyo, Shawnee State Forest, West Portsmouth, Ohio, May 23-26, 2008.: Image Credit: Scioto Historical Collection, Digital History Lab, Clark Memorial Library, Shawnee State University, Portsmouth, Ohio. 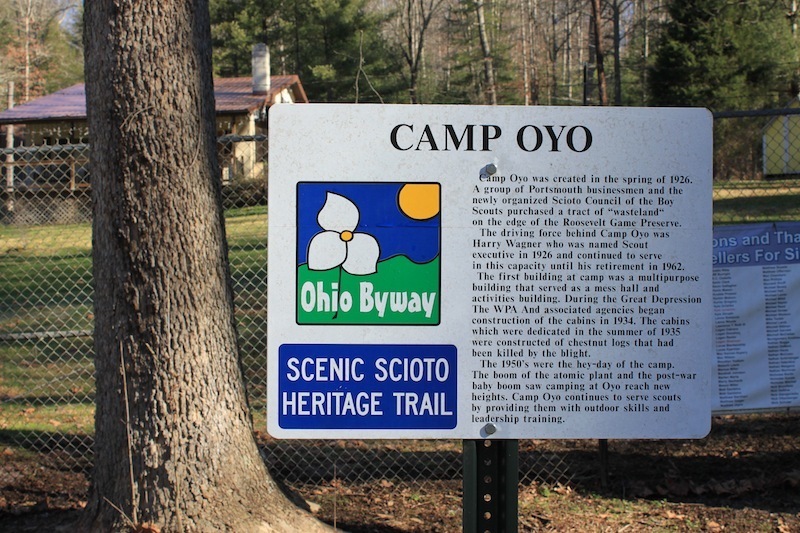 Camp Oyo, Scenic Scioto Heritage Trail Marker (13 December 2012). : Image Credit: Andrew Lee Feight, Ph.D., from the Scioto Historical Series, private collection, Friendship, Ohio. 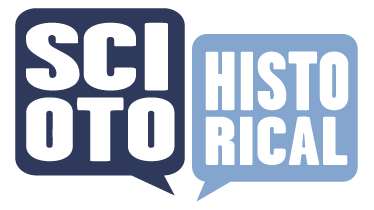 Andrew Lee Feight, Ph.D., “Harry Wagner & the Origins of Boy Scout Camp Oyo,” Scioto Historical, accessed April 24, 2019, https://sciotohistorical.org/items/show/68.